Stockholm has just played host to nearly 3,000 policymakers, scientists, corporate professionals and students attending World Water Week. Whether discussing the biology of the Mekong giant catfish or the effects of sanitation on school attendance, they are all trying to make the most of this resource that sustains life on Earth. It is water’s essential, irreplaceable nature that draws this diverse group together each year. The scientist advocates for the needs of species that cannot speak for themselves. The student is on the cusp of perfecting a new technology to purify water. The corporate professional has just learned her supply chain is in a river basin facing severe water scarcity. The policymaker must try to balance the need to deliver a human right, feed a nation and fuel an economy. WWF occupies a unique position in the global water discussion. We are a voice for nature, reminding decision makers that water doesn’t come from a pipe. Functioning ecosystems provide our water and a host of other services. It’s more cost effective to maintain and protect these ecosystems than to engineer solutions to problems of our own creation. WWF is also a partner of governments and companies that are striving to achieve sustainable water management. This is where the concept of water stewardship comes into play. Water stewardship is at an interesting point in its conceptual evolution. There’s enough substantive discussion that people think it’s important, but it’s new enough that there’s not a universally agreed definition. This can leave people thinking they should be doing it, but unsure what IT is. This slim volume succinctly puts WWF’s “stake in the ground” on what’s worthwhile and what’s not when it comes to business engagement on water. We base our definition on the insights gained from our contributions to many of the aspects that make up water stewardship, including river basin management, water footprinting, risk analysis and metrics, stewardship strategy, public policy guidance, standards development and partnerships with companies in stressed watersheds. WWF has issued this brief because as more companies come to understand their water-related business risk, more will engage on water issues. This should be good news – more resources and creativity brought to bear on the challenges at hand. However, we recognize that business engagement in water management debates, and especially public policy, provokes significant concerns from some NGOs and the public, including fears about business takeover of global resources. To ensure that the profit motive of companies is balanced with social and environmental values, WWF and others must be able to separate water stewardship rhetoric from substantive action. We do not want to see effort wasted pursuing dead-ends and ineffective approaches; nor do we want to see greenwash in business water responses or dilution of the term water stewardship. 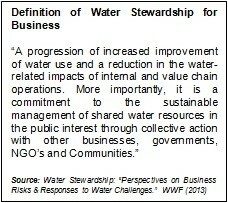 We don’t expect our brief to be the last word on water stewardship; on the contrary, we expect it to provoke discussion. The water challenges we face are multi-faceted, and the responses must be, as well. Water Water Everywhere; Only If You Share -Effective Partnerships, between the public, corporate sectors and civil society are an essential component of effective water stewardship. Here we review five such water partnerships. 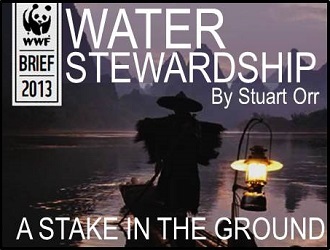 Stuart has been with WWF since 2006 and works with the private sector on a range of water related activities, from water footprint to public policy engagement. Stuart has published numerous papers on water measurement, agricultural policy and water-related risk, and is currently co-drafting policy guidelines for the private sector as part of the UN CEO Water Mandate. Stuart has also recently joined the World Economic Forum’s Global Agenda Council for water. Previous to life with WWF, he researched agricultural rice systems in West Africa and worked for many years in the private sector in Asia and the US. Stuart holds an MSc in Environment and Development from the School of International Development at the University of East Anglia and is currently based in Switzerland where he works at WWF-International as a Manager in the Freshwater Team.